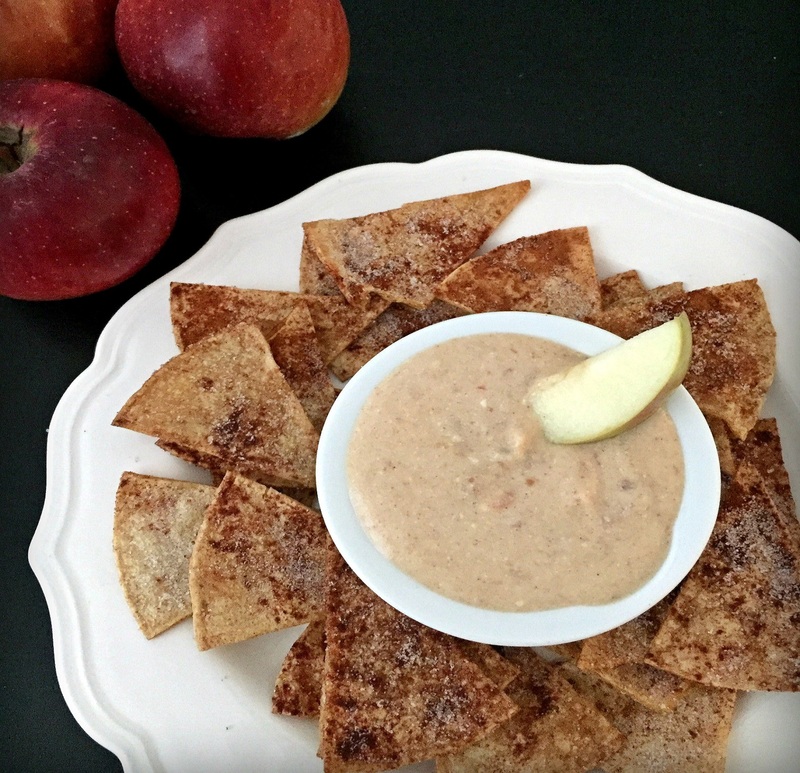 I love bringing this dip to a fall potluck or as a healthy dessert option for Thanksgiving. The dates give it the perfect caramel flavor without the added sugars and artificial ingredients found in typical caramel candies. Plus they are rich in vitamins and minerals such as potassium, magnesium, and fiber which have a whole host of health benefits. Since it’s mostly carbohydrates, enjoy it with a meal rich in protein and a little fat to stabilize your blood sugar or simple enjoy it anytime as a healthy splurge! Soak dates in a bowl with warm water to soften them. While they are soaking, make the chips. Put chips in a bowl and liberally spray with cooking spray. Combine cinnamon and sugar in a small bowl and then toss chips with mixture. Put chips on a baking sheet in a single layer making sure none of them are touching. Bake for 10 minutes, flip, and bake for an additional 3-5 minutes or until crispy. Next, make the apples for the dip. Coat a nonstick skillet with cooking spray. Add apples, water, brown sugar, and 1/2 tsp of cinnamon to the skillet and cook, stirring continuously, until apples are caramelized and very soft. Set aside and allow to cool. Next, pulse the soaked dates in a food processor on low until they are chopped into small bits. Stream in 1 tbsp of warm water until a paste is formed. Add the yogurt, cooled apples, and remaining 1/2 tsp of cinnamon and blend until completely smooth. Chill dip for at least 15 minutes to set. Serve alongside cinnamon-sugar chips and apple wedges, or get creative with any other fruit you desire!